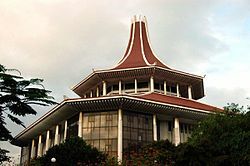 The Supreme Court last Monday (18) issued an order debarring Attorney-at-Law Nagananda Kodituwakku from practising as a lawyer for a period of three years. Kodituwakku told the media that he appeared for himself as an ordinary citizen in a case before the Court of Appeal that was filed challenging the importation of crude palm oil. The Supreme Court three-judge-bench comprising Chief Justice Nalin Perera, Justice Sisira de Abrew and Justice Prasanna Jayawardena delivered a ruling last Monday pursuant to a complaint made by Supreme Court Justice Vijith K. Malalgoda concerning improper, insulting, intolerable, unbecoming and contemptuous behaviour on the Court of Appeal by respondent Nagananda Kodituwakku. The Supreme Court found the respondent guilty following an inquiry and ruled that Nagananda Kodituwakku has breached rules Number 60 and 61 of the Supreme Court. During the inquiry, Kodituwakku had expressed his willingness to tender his apology to Justice Malalgoda and expressed regret to the utterances he made on May 21, 2015 at the Court of Appeal.